This time, there will be no turning back. Excerpt from Goodreads. 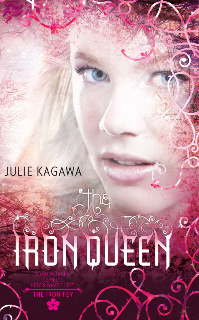 First let me say I reviewed this book about a month ago but, I love Julie Kagawa's Iron Fey series so much I wanted to spread the love over here on the blog :) so here's my review from goodreads. Just when I thought The Iron Fey series could not possibly get any better The Iron Queen comes along and proves me wrong. Julie Kagawa has written another brilliantly woven tale full of romance, adventure, and danger. It is so well written that I felt like I was there and could see, hear, smell, and taste everything. Meghan Chase's relationship with Ash is one of the best written love stories. I felt everything they felt I cried when they cried. Ash has become to me what most Twilighters think of Edward Cullen. Puck also is amazing in this book he proves what a true friend and companion is as well as Grimalkin I believe he actually is starting to care for as he calls Meghan "the Human". Julie aslo brings in many new characters that keep the story going towards the future I won't mention names as to not spoil the book. Be prepared to have a box of tissues on hand for the end of this one. The last chapter and epilogue made me cry and left me very red-eyed. If you love stories about fairys then The Iron Fey is a must read. Julie Kagawa has quickly become one of my favorite authors! Thanks to @NetGalley for the ARC!